A quality replacement USB Sync and Charge cable for Smartphone, Tablets and other devices. It's all too easy to loose, break or just require a longer USB Sync or Charger cable for your USB powered devices. You may need extra cables to be kept at the office, home or on location but can't justify the high price for original device manufacturer products. 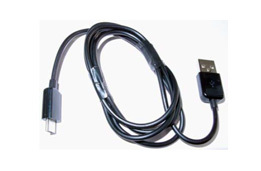 The new C-USB-MI is a totally compatible data synchronisation cable for the majority of Android™, Blackberry™ and Computer Tablet devices currently in production today. Using the industry standard micro USB port found on these devices, the C-USB-MI comes in a generous 1-metre length cable, the other end is connected to your Computers' USB port or, if you have one, the standard electrical wall plug with USB input. Sync all your mobile data, transfer digital audio, movies, or just simply backup your devices to another computer, the C-USB-MI uses the same technology as the leading manufacturers so you can be sure of exceptional performance and compatibility.